Al-Hadid makes complex sculptures that seem in a state of flux, suggesting both incompletion and decay. Underlying her large-scale, baroque forms are a wide array of influences, including ancient Biblical and mythological narratives, Arab oral traditions, Gothic church construction, Western painting, Islamic ornamentation, and scientific advances in physics and astronomy. The exhibition features a single new monumental sculpture—Trace of a Fictional Third—that interweaves landscape, architecture, and the human figure. It is accompanied by a selection of new, heavily worked graphite drawings that shed light on Al-Hadid’s creative process. Al-Hadid received her MFA in sculpture from Virginia Commonwealth University in Richmond and currently lives and works in New York. Al-Hadid was born in Aleppo, Syria, in 1981 and moved to the United States as a child. She studied sculpture and art history at Kent State University in Ohio (BA and BFA, 2003), and earned her MFA in sculpture from Virginia Commonwealth University in Richmond (2005). Her work has gained international attention, including recent solo exhibitions at Centro de Arte Contemporáneo, Murcia, Spain; Nevada Museum of Art, Reno; Nasher Sculpture Center, Dallas, Texas; and Hammer Museum, Los Angeles. She currently lives and works in New York. Al-Hadid’s work is characterized by ambitious scale and complexity both based on a wide range of intellectual and personal sources. She uses everyday materials such as cardboard, plaster, plywood, and resin, pushing the limits of their physical properties to create a sense of precarious balance and impending collapse. Her works often refer to recognizable architectural components—towers, cathedral spires, labyrinths, and classical columns—while also incorporating elements of nature and the human form. Balancing the monumentality of Al-Hadid’s sculptures is a quality of light that seems to animate and deconstruct them. While she leaves behind the folkloric, mythological, and historical narratives that inspired previous works, Trace of a Fictional Third continues her interest in themes of time and motion. Cascades convey liquidity; undulating fabrics merge with more solid structures. And examples of the human figure, more overt than in prior work, are both voluptuously corporeal and spectral. This sculpture is suspended largely within an imagined pyramidal grid and lifts away from a cluster of pedestals. It translates painterly tropes and isolates figuration, landscape, and architecture into a composition almost exclusively of linear and planar elements. Two figures rest marking the corners of an overall triangle, the viewer implicated as the (fictional) third. 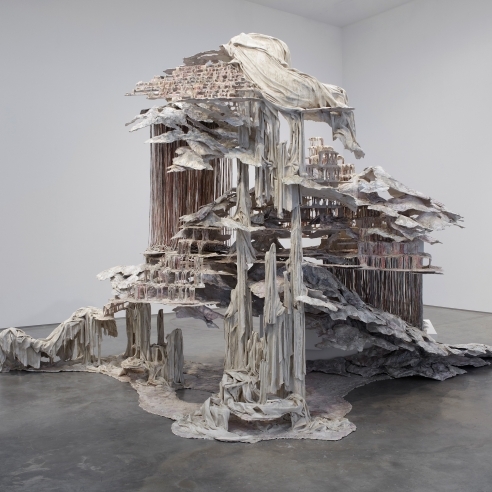 Diana Al-Hadid: Trace of a Fictional Third is organized by the Virginia Museum of Fine Arts and curated by John B. Ravenal, Sydney and Frances Lewis Family Curator of Modern and Contemporary Art. The sculpture is on loan courtesy of the George Economou Collection. The exhibition received support from the Marianne Boesky Gallery, New York.